As my blogger buddy Pooja said, winter in green. So I thought why I don’t try cooking some green dish. After scratching my head and also my hubby’s head I thought why I don’t try some green rice for our lunch box. So I rushed into my kitchen and opened my treasure chest which happens to be my fridge and started taking out whatever green veggies available there. Well, I had Coriander leaves, Mint leaves, Green Chillies, Dill, Green Peas and Broccoli… Wait a second, broccoli? Well, why not? 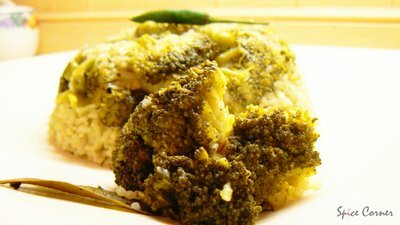 If we can make cauliflower rice then why not with broccoli? So with this thought in mind and backing up from my sweetheart I went into a mission of creating my own version of ‘Green Pulao’. Soak rice in water for 15-30 minutes, wash and drain excess water. In a pressure cooker, heat ghee and add cinnamon, cloves, cardamom and bay leaves. Fry them till they start leaving aroma. To this add cumin seeds, chopped onions, ginger and garlic paste and fry till onions turn transparent. Now add washed rice, ground paste, salt and pepper powder and fry for 2-3 minutes. Add broccoli florets and green peas and enough water and pressure cook till done. Serve hot Green Pulao with any Raita of your choice. Lovely looking pulao!! 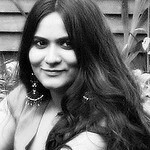 and so healthy too Supriya! I'm just kinda afraid that the broccoli will dominate the tatse of pulao, so never tried it...but I will do so,by adding the peas and coriander! Looks beautiful. Bet itz as yummy too. 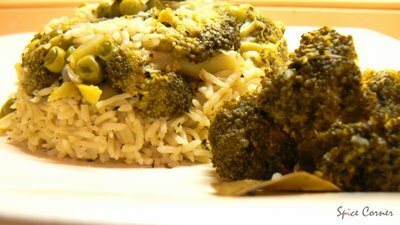 I have tried rice with veggies, but because of the pungent smell of brocolli I was not sure if it would hamper the flavour of the rice. 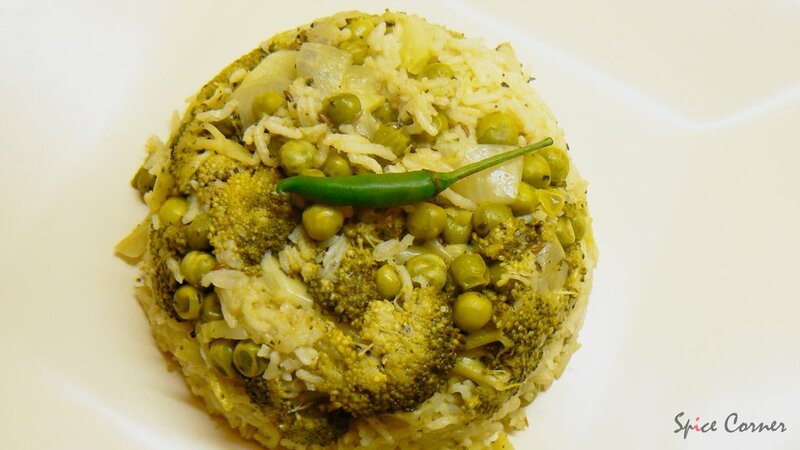 green pulav, looks hdelicious and is healthy. Go green! I love broccoli. Dish looks wonderful and guess what I have in the fridge? Will be broccoli rice for dinner. Doh! I just made a batch of Trupti's Broccoli Methi curry last night. Ah well. This will have to wait until next week. For awhile I didn't know if I wanted to make your broccoli soup or trupti's curry. But will be posting it up soon. Btw, when I said Krishna will be missing you...I was talking about my Krishna (my hubby's name is Krishna as well!) as I will start to slack off! :) lol! both our hubbies have same name! Kewl! looking forward to your return then! i dont know why my comment on this is not published, thats why writing here agian. 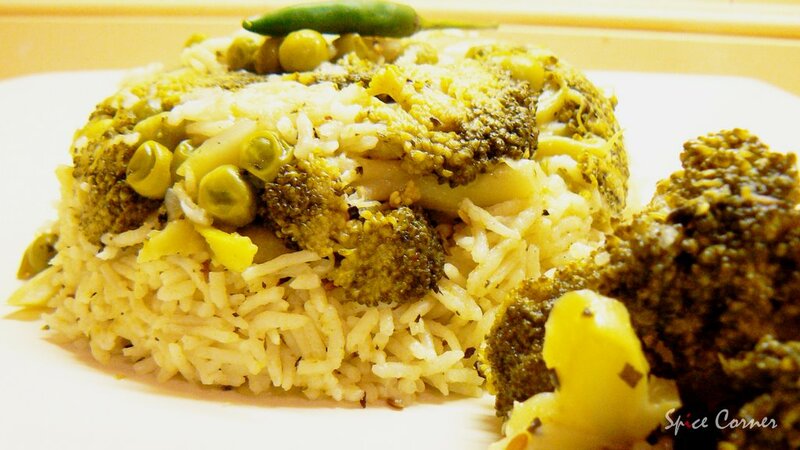 great recipe with green pulao. i liked it very much. still waiting for your email, which u promised to write to me. :( . thanks buddy for mentioning my thought of green winter here :) . I will let you know about next week's veg as soon as i will finalise. be there as you are.